I think its very easy to read the content of Hesse’s work as abject, the first work looks like egg sacks (the monstrous maternal), pendulous breasts (female, monstrous and aged), or droplets of spittle, perhaps sweat or seminal fluids. In the second work, the piece is reminiscent of intestines, like sausage casings before the meat is inserted, separated from the body and hung like a web (a nod to the monstrous but generative figure of spider woman?) 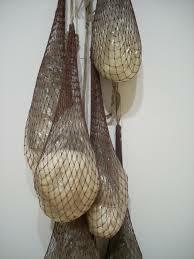 or some sort of tangle yarn, where craft symbolizes the feminine, the debased and the lesser. Perhaps the viewer has wandered into the farm house of Ed Geins, not a gallery. In the final work, the sculpture seems to represent overly elongated limbs on faceless torsos, maybe sagging scrotums or other lumps of flesh hanging and pooling on the floor. However, what fascinates me in Hesse’s work is the materiality and its links to the abject. In the third image, Hesse again references the body turned inside out. The masses of cordage overwhelm with a kind of frenetic chaos that references intestines again. Or are they giant hair balls? Perhaps the masses are the nervous system, the intricate and massive system of synapsis, arteries and veins, pulled out of the body and put on display like messy versions of Gunther van Hagen’s plastinated arterial systems. Moreover, the literal materiality of the works speak to the heart of the abject, the cadaver. Hesse’s work performs the ultimate abjection as her world is literally disintegrating, aging and dying before our eyes. Many of the materials, like latex, are not stable, they degrade at a rapid rate, at least rapid in the context of the art world which fetishizes works that are hundreds of years old. 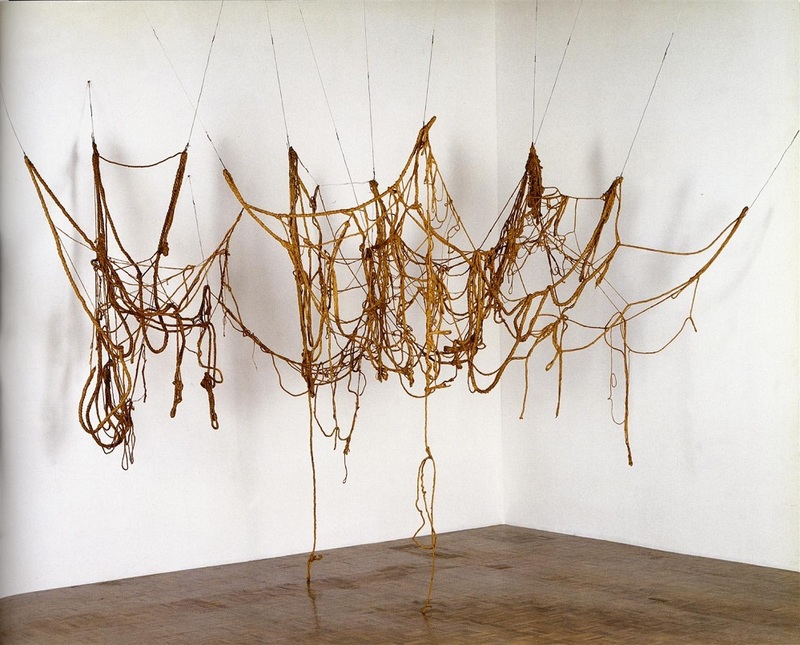 Hesse’s works, while only a few decades old, are deteriorating; the latex is breaking down, the elasticity that held her works up in and in tension is sagging as the fibers rot and break. The body is often conflated with texts, and texts with the body. Hesse’s “texts” are aging just as the body does, heading towards their eventual dematerialization. As the abject is that which must be rejected and jettisoned to maintain the clean and proper, to create the stable ego, death is the ultimate abject. Death is what we must perpetually deny to continue to function in the world. However, as the abject can never truly be radically rejected, since it always haunts us from the edge of our periphery, death is never truly gone from out consciousness. Hesse’s works perform the abjects return. Art is understood as timeless, lasting far longer that its creators. It is the dead speaking to us from the past, a source of perpetual life for those voices. Yet, Hesse’s work demonstrates that art, like everything else, including ourselves, will eventually cease to exist.